So this week I was once again tasked with the job of deciding what movie to pick for my weekly costume review. All the Oscar nominated movies with worthwhile costumes are still in theatres, and I've recently been boycotting going to the movies for personal reasons (someone actually took their baby with them to see The Hobbit a few weeks ago, all I'll say is it didn't turn out well for anybody). 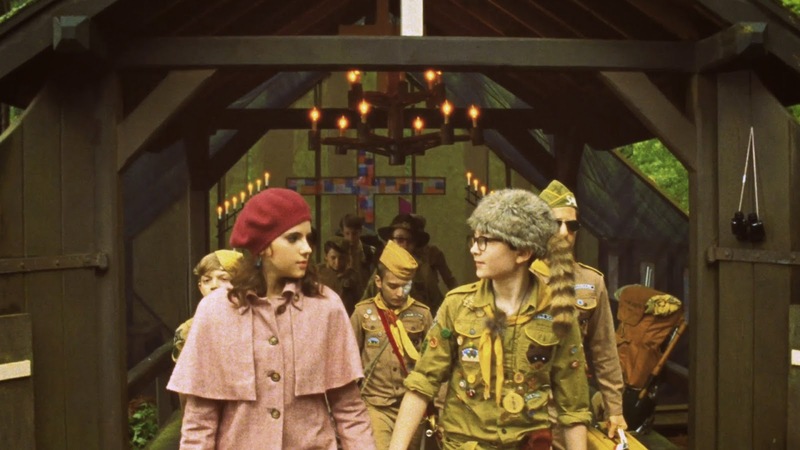 Anyways, this left me in a bit of a pickle so I decided to stick to my recent Wes Anderson binge and re-watch the 2012 gem, Moonrise Kingdom. It's so cute and so fun and anybody who knows me knows I'm a sucker for anything 60s related, which is the time period where the movie is set. The story follows a pair of young and infatuated lovers who decide to run away together from their small New England island, which causes a frantic search party to chase after them. Sam Shakusky, our lead character, is a Khaki Scout, so his main piece is the traditional boyscout uniform. He wears his badges proudly, along with his Coonskin cap, which is completely true to the time period. Boys during the 50s and 60s emulated Davy Crockett with these hats, it being a huge trend of the time. Sam's a bit of a know-it-all as well, and you can totally tell from the way he's dressed. Unlike Some of the other scouts, his uniform is always put together to perfection, with his socks always pulled up high. He carries a backpack with all the things a well-rounded Khaki Scout should have, and his camp leader even mentions at one point that whoever is to run away with him is in good hands. Isn't this simply the cutest dress ever? I've been on the lookout for something even remotely as charming. Suzy Bishop, the other half of this duo, I would say is completely inspired by her French icons of the time. She says at one point that her favourite record is one by Francoise Hardy and you can definitely tell she borrows elements from her overseas idols. Dainty Peter Pan collars, mini dresses, knee-high socks, and berets all add to the Parisian charm of the 60s. Suzy also keeps her clothing palette to girly pastels, which serve as as dead give-away to her sensitive nature. She acts really tough but deep down has a romantic soul that ultimately did run away to be with her love interest. 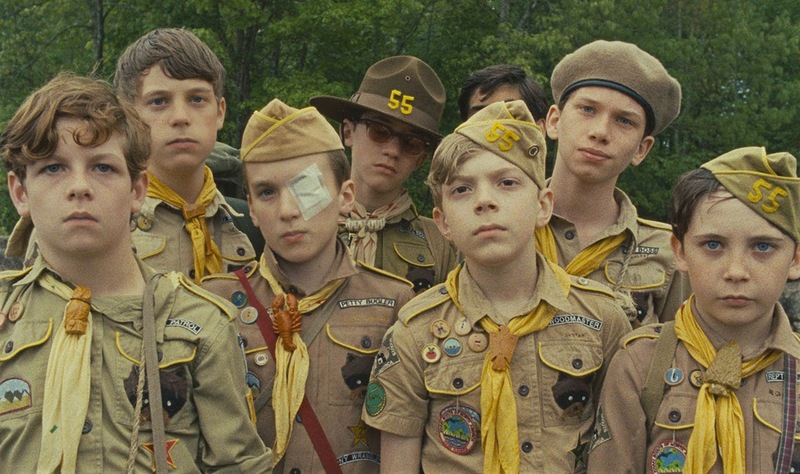 As for the other characters, like the Khaki Scouts for example, paying close attention to their uniforms gives a glimpse to their personalities as well. The badges that each scout wears vary, the one's closer to their shoulders signify what they specialize in and fit with their personalities. For example, one kid has a badge with the words "Judo Expert" on it. His uniform is slightly darker than the rest and he just generally has a bit more of a reckless personality, rides a motorcycle, and asks if he can use "force" to bring back Sam to the campsite. Imagine how long it must have taken for all those badges to be sewn on! There are so many intricate details to this movie that the best thing I can say is to see for yourself if you already haven't. Re-watching Wes Anderson's films I can only compare to that of reconnecting with an old flame that you'll always have a soft spot for. You just so happen to run into his movies, decide to spend all of your waking hours watching them engulfed in a whirlwind of emotions, only to stop and go your separate ways with fond memories of your adventures together. Want to try something similar to what Suzy has on? Take a peek. These costumes are amazing and I love how you found some inspiration from today to fit. Perfect! I do love those cute mini dresses with lovely collars she is sporting! This does seem like a charming film. Thanks for the recommendation. I was totally disappointed by Hobbit. I've been a fan of Tolkien since I was 10 so this series was surely a disappointment and even the acting wasn't up to the level. On another subject, taking a baby to see a Hobbit? What were they thinking! I can't even imagine that get-up for a flight attendant! That's so excessive, I can't believe it! The Hobbit let me down too, there were so many plot lines that were added in that didn't come from the book. I did feel like rewatching the Lord of the Rings after though, just to compare how it all comes together! 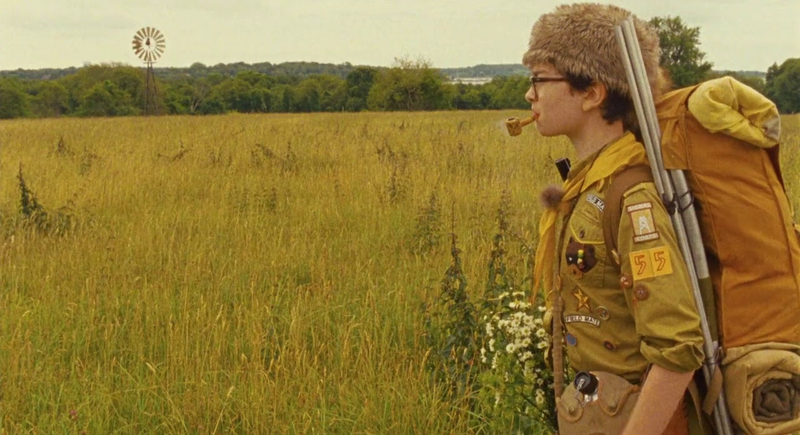 You should totally watch Moonrise Kingdom however, I think you'd like it. It's adorable! Fabulous blog! Want to follow each other? Make sure to leave a comment on our blog. The costume turned out so cute! Great post! Such an interesting combo! I love these shoes! wow very interesting! And cool! Fantastic post <3 love how you created the outfit at the end, spot on! Awesome post! I love these posts, I very rarely see review of movie costumes! Have a nice day! Thank you! Yeah I noticed people don't do enough of them. They're fun! This seems like a really cute movie! Love the pretty peter pan collar dress worn by the female lead, very charming outfit indeed!